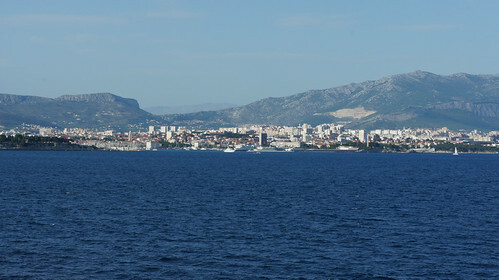 Last port of call on our cruise is Split, Croatia, another popular summer destination on the Dalmatian coast. NCL Jade is a bit too big for the cruise port so the ship anchors a mile offshore and tenders ferry passengers to and from the Riva, Split’s scenic waterfront promenade. 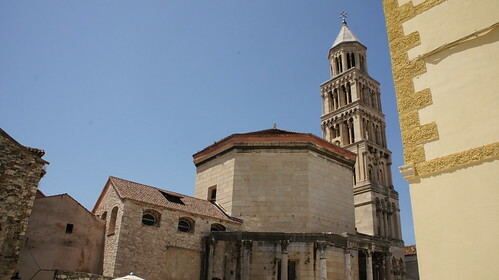 The centerpiece of Split is Diocletian’s Palace, grand retirement home of that Roman emperor, finished in the 4th Century AD. 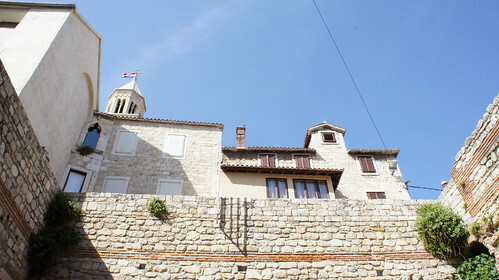 Over the centuries the palace has evolved from royal villa to fortified keep to walled city to tourist destination, and today is home to varied Croatian residences, hotels, shops, and museums. Alighting from our tender we cross the Riva and enter the Palace through its sea-facing south portal, the “Brass Gate,” descending into a lower-level bazaar of souvenir shops and trinket stalls sitting underneath stone arches and vaulted ceilings. 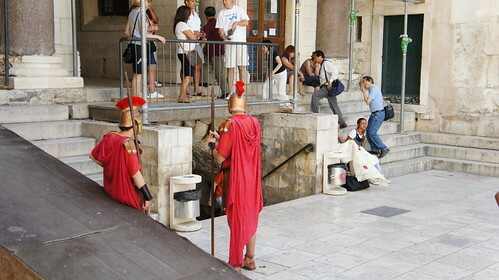 On the other end of this we ascend some steps and emerge into the Palace’s central plaza, the Peristyle, where an imperial reenactment is ongoing. 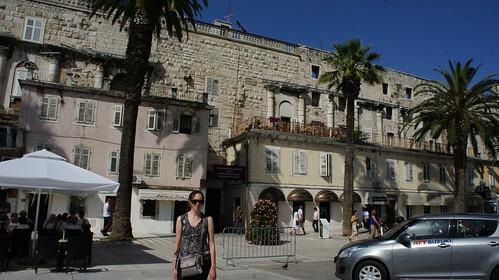 The tourist center is here as well, where we get a free map courtesy of Discover Split. 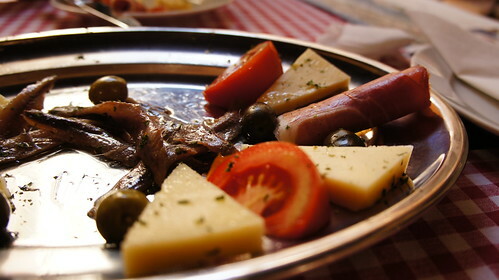 Before anything, it’s time for lunch. We wander the alleyways for a bit and finally settle for Ristorante Atrium, a little konoba nestled in the inner courtyard of what I think is Cindro Palace, built in the old northwest quadrant of the Roman villa. 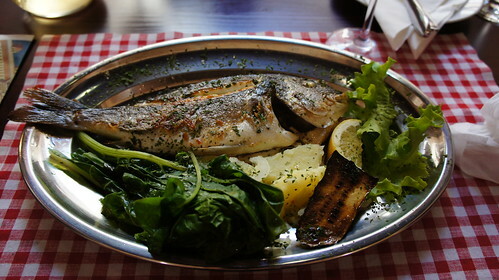 It’s a hotel eatery and the food is priced at tourist trap levels, but the Dalmatian ham with cheese and anchovies is rich with flavor, and the broiled whole sea bream rubbed with Mediterranean salt and garlic alongside spinach and zucchini soaked in olive oil is, without exaggeration, some of the best food I have ever eaten anywhere in the world. After lunch we drop by a little closed garden nearby. Above it, Croatian locals hang laundry from clotheslines between stone walls in a quintessentially idyllic ancient Mediterranean small-town scene. 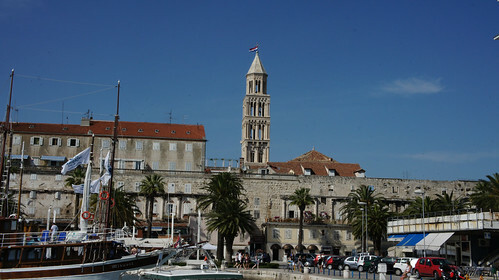 From there we go to the Muzej Grada Splita, a former 15th Century palace later converted into a library and then museum of the city’s history. Lots of paintings and artifacts but no photos allowed. 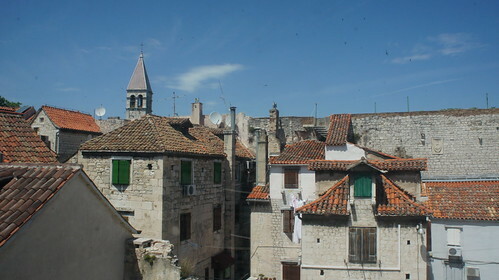 I do get a shot of the rooftops of Diocletian’s Palace out a window. We return to the peristyle and ascend the Bell Tower for a better view of the area. A narrow, slippery stone stair gives way to an old stone landing, then to a newer — but creakier — steel stairway that goes to the top of the tower, ascending past thicker stone walls and clinging unsteadily to thinner, crumbling arches, with only a tenuous handrail shielding the climber from a hundred foot drop. Rust stains the steps and railings. 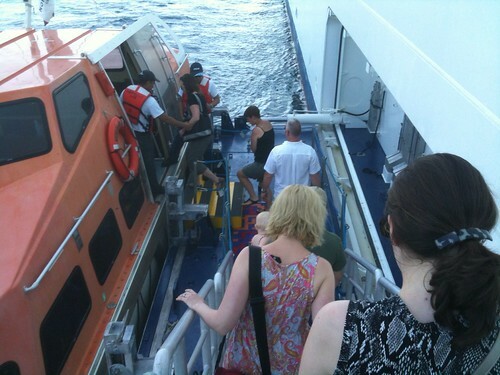 Amy opts to skip this higher stair and wait below while I press upward. 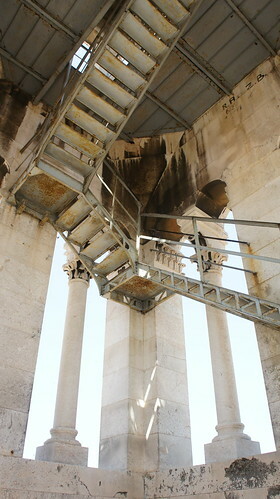 At the top, the belfry platform vibrates in the wind and is spotted with rust, but there are lovely panoramic views of Diocletian’s Palace and Split. In the distance, our ship sits anchored in the harbor. I get the photos I wish and hurry back down to meet Amy by the bells. We descend from the tower and enter the Cathedral of Saint Domnius to see its treasury of reliquaries and Romanesque sanctuary. No photos allowed. 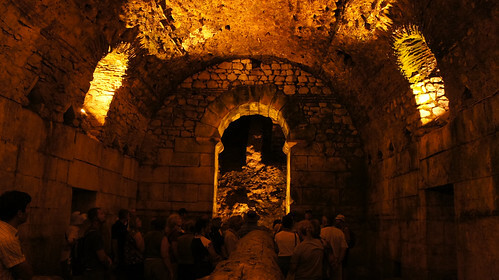 Around a corner we descend into the crypt of the old mausoleum, where I get a photo down a well. Across the peristyle is the Baptistery, formerly Roman Temple of Jupiter, converted in the Middle Ages. 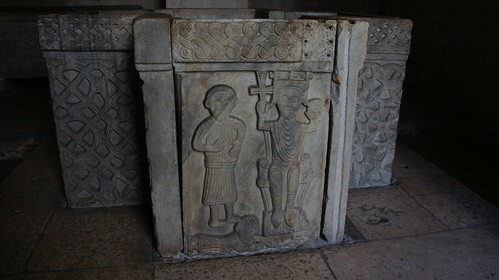 The space is a mishmash of styles from ancient Roman to Croatian Pre-Romanesque to Gothic. 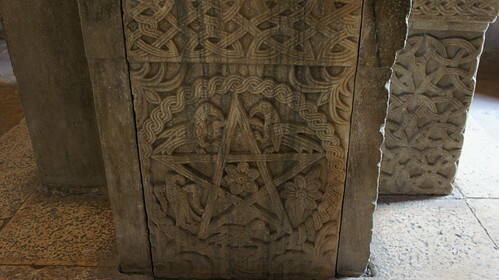 Inside, a marble font is adorned with reliefs of a medieval king and a pentagram with braid flourishes. 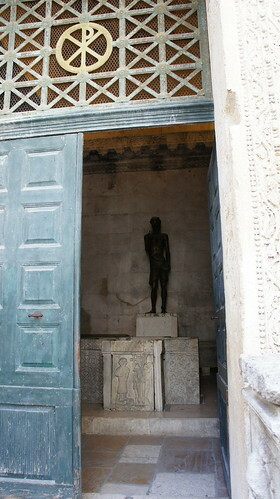 On top of the font is a relatively recent (1950s) bronze statue of John the Baptist. 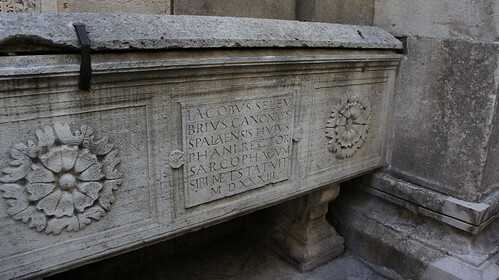 Outside the baptistery are two sarcophagi, one of the archbishop of Spalaetensis, as Split was called in Latin at the time. 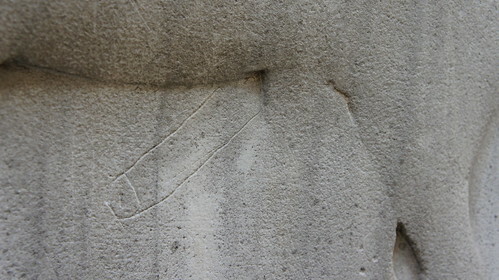 Later vandalism hilariously mars this relief of a horse and rider. 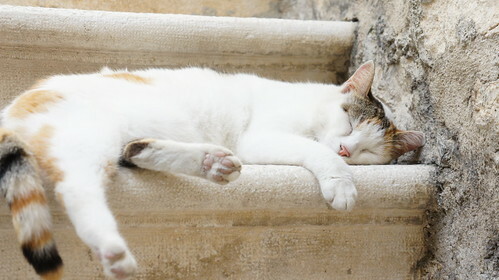 Returning to the peristyle we see a sleeping cat. 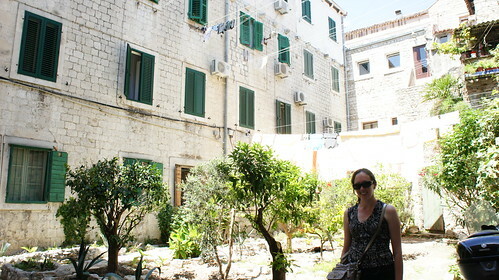 The rest of this too-short day is spent exploring the basement of Diocletian’s Palace. 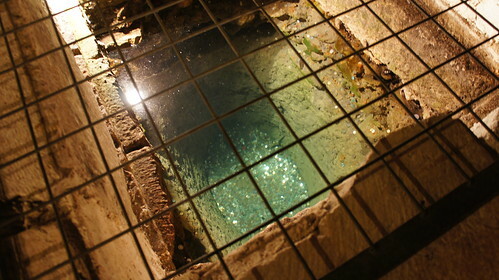 Used for sewage and piled with trash for centuries, the stone under-levels escaped the Palace’s above-ground evolution, preserving the original layout of the structure. 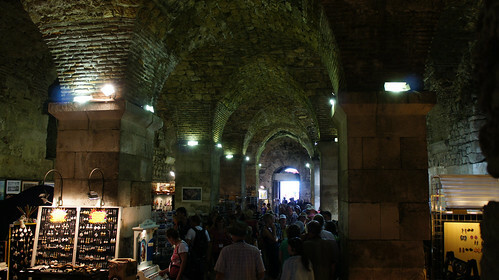 Today the vaulted chambers have been cleared, restored, lit, and decorated as a minimalist museum of the Palace’s history. 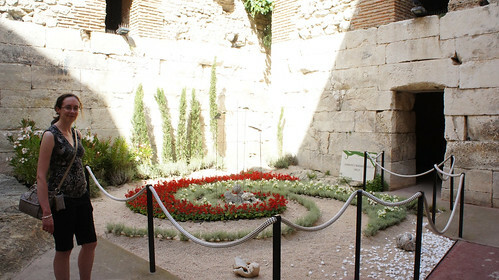 In places where the ground previously caved in, the basement is open to the sky, and these sunlit spaces now serve as small gardens. 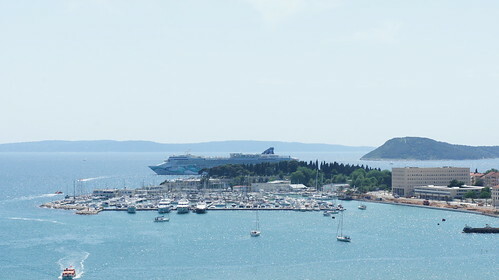 Alas, our port stop is too short to see the rest of the city of Split, and we haven’t seen all of Diocletian’s Palace, but it’s time to get back to the ship. As we cross the Riva back to where the tenders are docked, I know I want to come back here some day, to revel in this place where Ancient Rome and Modern Croatia mingle so casually. Soon, we are watching Split disappear over the horizon as the ship points its bow back towards Venice. Our journey is almost at an end.